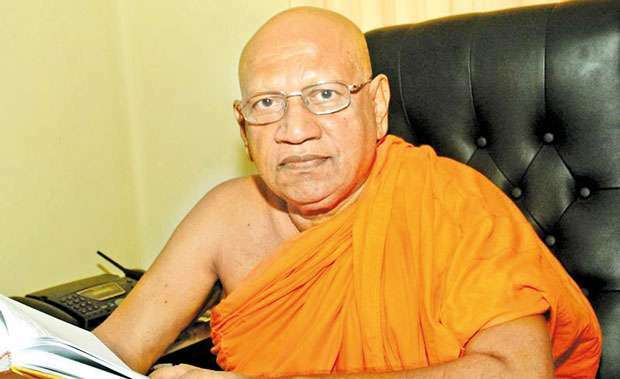 Former Chancellor of University of Jayawardenapura, the scholar monk who raised the institution to national and international fame, Bellanwila Wimalarathana Anunayake Thera (1942 – 2018) passed away on the 3rd day of February 2018. The Thera’s first remembrance falls on the 3rd day of February 2019. His life was an extremely dedicated life which was completely endowed with a unique personality of his own. Bellanwila Wimalarathana Anunayake Thera was born on the Sinhala and Tamil New year day in 1942 at Veedagama in Kalutara district, which was the native village of his mother Mrs Buthsilina De Silva. Mr. Omaththage Paul Perera was the father and he was the brother of Ven Bellanwila Somaratana Nayake Thera, Chief incumbent of Bellanwila Rajamaha Viharaya. The little boy was the fourth of the family of six boys and was named as Gilbert. The second boy of this family was entered to the Buddhist Monastery under the tutelage of Ven. Somarathana Nayake Thera and was named as Bellanwila Dhammarathana, the current Chief Incumbent of Bellanwila Raja Maha Viharaya. The boy Gilbert had received his basic education at Nikape Village School and Piliyandala Central College. Upon the death of his father he was ordained under the tutelage of Ven Somarathana Nayaka Thera in 1956 and named as Bellanwila Buddharathana, later changed to Wimalarathana. After the ordination, this novice monk was enrolled at Pravachanodaya Pirivena in Molligoda and later moved to the prestigious Buddhist institution of Vidyalankara Pirivena in Peliyagoda. After completing the oriental studies with flying colours, Ven Wimalarathana entered the Vidyalankara University and obtained the Bachelor of Arts degree in Pali, Sinhalese and Economics. After completing his studies the Thera started his career as the Head Master of Sunethra Devi Pirivena, Pepiliyana. Later he served as the Head Master of Paramadhammachetiya Pirivena Ratmalana and Teachers’ Training College for Pirivena Teachers in Ratmalana. While serving as a head master, the Thera enrolled at the Vidyodaya University and completed a B.A. Special degree and later completed formal higher education by obtaining the PhD degree from University of Lancaster, UK in 1980. After completing the PhD, Ven Wimalarathana Thera joined the University of Sri Jayawardenapura and started his career as a lecturer in the Pali language. With the immense service of the Thera, gradually he was promoted to the position of Senior Lecturer, Head of the Department, Associate Professor and Professor. After retirement the Thera was awarded the prestigious position of Chancellor of the same University by Mrs. Chandrika Bandaranaike, the former President of Sri Lanka in 2005. The Thera was then involved in the administrative activities of the Buddha Sasana, through Kotte Sri Kalyani Samagi Dharma Maha Sanga Sabha of the Siam Sect, joined as a committee member of the Sangha Council in 1972 and later was elevated to the positions of Deputy Registrar, Registrar, Upadhyaya and Anunayake. After the passing away of Ven. Bellanwila Somarathana Thera and Ven Dr. Bellanwila Dhammarathana, Ven. Prof. Bellanwila Wimalarathana became the Chief Incumbent and Deputy Chief Incumbent of Bellanwila Royal Temple respectively. Hence Ven. Dr. Dhammarathana was involved with the religious activities in Singapore, Prof. Wimalarathana became the keynote personality and undertook all the responsibilities at Bellanwila Temple. As a scholar, Ven Wimalarathana wrote several books in Sinhala and English and seerved several Buddhist organizations both local and International. The voice he raised on behalf of the public is unique. He openly pointed out the mistakes of politicians. The most Venerable Wimalarathana Thera met with an accident while he was feeding the baby elephant of the Temple on the 2nd day of February 2018. The Thera was rushed to the hospital and had to undergo an operation. However, he died due to a heart attack at 11.15 am on February 03, 2018. May Ven. Prof. Bellanwila Wimalarathana attain the supreme bliss of Nibbana.